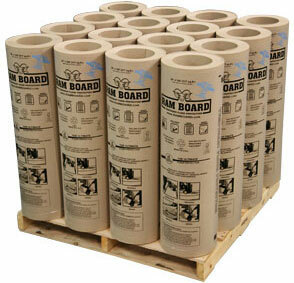 Ram Board is a heavy-duty, temporary floor protection engineered for Contractors. Designed with cost and efficiency in mind, it lays out fast and is re-usable. Ram Board is non-staining and utilizes Flex-Fiber™ technology allowing for the proper curing of new floors on jobsites. Exclusive Spill Guard™ technology provides added protection against water, paint, mud, and more. NOW IN STOCK AT MENTOR LUMBER & SUPPLY CO.
Ram Board provides proven and trusted protection for new and existing concrete, wood, tile, stone, linoleum, vinyl composition tile(VCT), epoxy and most other floor types. In terms of floor protectors Ram Board is the #1 choice among contractors worldwide. Ram Board is committed to being a good steward of the environment. It is composed of 100% recycled materials and contributes toward LEED credits.